After just one year from their previous album, BLUT AUS NORD releases their new lucubration Odinist: The Deconstruction Of Reason By Illumination. An eccentric album that provides the soundtrack for the depths of Hell. It was 1994 in Mondeville in France, when BLUT AUS NORD came to life as a solo project of Vindsval under the name VLAD. They recorded two demos under that name and changed it after one year, just before the release of their first full length album, Ultima Thulee. 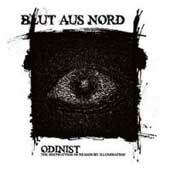 During their next releases, BLUT AUS NORD made a turn to a more avant-garde metal style (the prominence of this turn was MoRT in 2006). It was 2004 when the band was no longer a solo project of Vindsval. Until then, all albums between the debut album and MoRT were recorded with the help of session musicians. An interesting point is that none of the lyrics of BLUT AUS NORD has ever gone public, except from those off the Memoria Vetusta I - Fathers Of The Icy Age album. Odinist - The Destruction Of Reason By Illumination: (the subtitle is a quote from Aleister Crowley) is actually made up of songs (again) and, even though the vocals do not drown in an endless pit of horrific effects anymore, the record is still difficult to access. To describe this album, imagine a foggy swirling nightmare encompassed by perpetual harmonic arbitration and unrest. There is never an easy resolution to the compositions as they blur all of the usual boundaries and humiliate your sense of logic with a decidedly conceptual feel to eventually help you gain some familiarity with this haunted, insane musical mind-set. Most of the times, BLUT AUS NORD are successfully combining melodies with atonal aspects. Not an easy task, I'd say. As a conclusion, Odinist - The Destruction Of Reason By Illumination: is not an easy album. You have to have guts to listen to it. Do it and you will surely have a place in Devil's left hand.